Located in a gated community 45 minutes north from the Puerto Vallarta airport, Four Seasons Resort Punta Mita is surrounded by lush jungle and an enviable white-sand beach setting. The resort is exclusive and luxurious, yet maintains a friendly and down to earth vibe, with golf-cart drivers greeting guests with an amiable "Buenos días" every time they pass them by. The beachfront resort's celebrated spa, exquisite restaurants, impressive cultural activities and championship golf course make the resort an excellent choice for families, couples and conference-attendees alike. YOU SHOULD KNOW The resort is currently going through some major renovations by their main pool and surrounding garden areas as they are building Dos Catrinas, a two story venue that will feature a restaurant and a sports bar. Dos Catrinas is expected to open in December 2018. 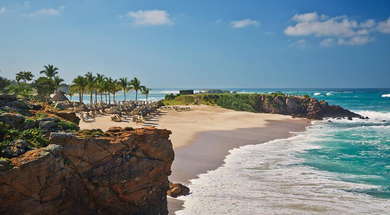 The resort's 177 spacious guest rooms open up to a private terrace or balcony with views to the beach, ocean or gardens. They're all located inside one, two and three-story 'casitas' and have a large, tastefully decorated lounging area. The signature plush beds guarantee a good night's sleep as you'll feel cocooned in a fluffy white cloud. In addition to the 'casita' rooms, there are 31 suites of up to 5 rooms, ideal for families or groups of friends traveling together. Some of them have private infinity or plunge pools with panoramic ocean views. If you plan to go before December 2018, ask for a room away from the construction by the main pool area and you won't even notice renovations are taking place. The oversized bathrooms are all equipped with a bathtub and a separate glass-enclosed shower with a rainfall showerhead that will help you de-stress, and they feature Citrus Verbena toiletries by L'Occitane. The terry cloth bathrobes are a must for the post bathing ritual, as they're lined with a super soft warm material. The slippers come in two sizes and are way more attractive than most hotel slippers, you might want to take home a pair! The lobby sits under a large palapa roof facing the ocean and is tastefully decorated in minimalist Mexican design. There are two large human-like sculptures that tower over the main sitting area and complement the whole rustic luxury feel. The infinity edge Nuna pool is the resort's focal point, but it was undergoing significant renovations at the time of writing. There is also an adults-only pool, Tamai, which offers quiet relaxation by the water on its many plush beds, hammocks and lounging chairs. The lazy river is a definite highlight for adults and kids alike, as guests can relax on a floating doughnut or noodle as the current pulls them slowly around the circular river. Apuane Spa is a tranquil oasis of 13 treatment rooms, cozy resting areas and advanced hydrotherapy features that include hot and cold pools. It offers an extensive menu of specialty massages, facials and body treatments that will leave you feeling relaxed, rejuvenated and pampered to the max. The massage beds are electric and mold to the shape needed, they also heat up. Go for one of the mind and body treatments; the Punta Mita Tequila Stone massage is out of this world! Besides the fully equipped gym that operates daily from 6 a.m. to 9 p.m., there are also anti-gravity fitness and aerial yoga classes, bootcamp classes and regular yoga. The resort offers guests a choice between three al-fresco restaurants and several snack bars by the beach or pools. Aramara serves contemporary Asian cuisine with inventive creations such as udon noodles with lobster in a rich curry. It has a private dining area for the popular 'Chef's Table' where some of the chef's best creations are paired with wine and cocktails. Bahía, on the resort's Las Cuevas beach, is a beachfront restaurant serving seafood with a Latin twist. The fish tacos are made with pescado zarandeado - a local specialty. YOU SHOULD KNOW The third restaurant, Dos Catrinas, is still under construction and will open in December 2018. It is highly recommended to book a table in advance at Aramara and Bahía. Bahía offers some of the region's most inventive cocktails, created by the resort's inhouse mixologist. The smoky mezcal and tequila-based concoctions are served in trendy skull or totem shaped glasses, and some actually have smoke coming out of them. Try the Cora beer, specially made for the resort by Minerva brewery. The resort has an incredibly knowledgeable Cultural Concierge who's in charge of leading a tequila blending experience where you start off with a tasting before creating your own personal blend, complete with a serial number for you to be able to order more bottles once you finish the one you take home. Besides the tequila blending experience, there is also a chocolate workshop, a Huichol workshop where guests create beaded wooden art pieces and a workshop to create papier maché Catrina skeletons. The resort also has a turtle release program complete with its own hatchery. The resort has golf carts that you can call whenever you need them to get around the property. If you want to leave the resort to go into town, the best bet is a taxi. The restaurants at the 'El Anclote' strip are a 6-minute drive away, including Tuna Blanca, sibling to the famed Café des Artistes. The recently opened Lobster Paradise sports impeccable maritime décor and has an air conditioned section perfect to escape the heat while sipping on a house cocktail. Los Agaves Restaurante & Tequila Bar is found close to El Anclote, whereas nearby hotels also have bars worth visiting, such as Chevycheria and Spice Market at W Punta de Mita. The beachfront setting and white-sand beaches truly set this resort apart. The quality of its dining, wellness and cultural offerings are ensured by the Four Seasons brand, as well as the warmness of its staff.